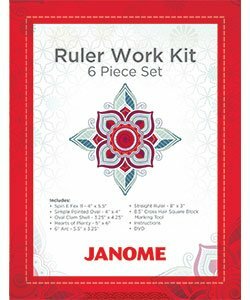 Designed by ruler guru Leonie West, this six piece template set will work perfectly with the new ruler foot for your machine! Included is a DVD with instructions on how to make your very own Ruler Travel Folder taught by none other than Leonie West herself! This kit is made up of six unique rulers with instructions on how to properly use each one. Hearts of Plenty – 5”x 6” Quilt beautiful borders and more by placing hearts along a base line of stitches. The pace between the hearts can be lengthened or shortened to space the hearts apart of overlap them. Simple Pointed Oval – 4” x 4” Stitch inside of the template for pointed oval repeating chains, simple flowers, and wavy lines. Oval Clam Shell – 3.25” x 4.25” The double Oval Clam Shell gives you 1.5”x1.5” and 1.5” x 2.5” oval clamshells. Spin E Fex – 4” x 5.5” Use this template to create many different patterns, motifs, borders, sashings and fills. 6” Arc – 5.5” x 3.25” This is a great template to use for curved cross hatching and filling small areas. You can stitch on the inside or outside edge of the template. Straight ruler – 8” x 3” Use for stitching straight lines for echoing, crosshatching and much more. Marked with 1/4” reference lines and 30, 45, and 90 degree angles. 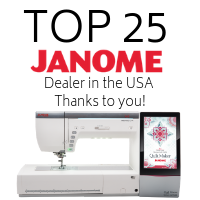 -This will work on the Janome Quilt Maker MC15000 or any MC150000 model that has been updated to at least version 3.0 or higher. -This can also work on any high shank model without auto-presser foot height adjustment when used with the Ruler Work Foot from the Frame Quilting Set (767434005).